Asian Cup squad, which was announced on Tuesday morning in Melbourne. However, there is one player who didn't make the plane to Brazil that really stands out. Nathan Burns. If there was ever a bolter in Ange’s selection for the Asian Cup, this is the one. Though, in reality, the Phoenix striker's form was simply too irresistible to ignore. Burns ticks all the boxes: he’s at a good age (26), playing regularly in a strong league and in red-hot form (10 goals so far this season). He comes in as the form player of the squad but, more importantly - and this is something Ange always looks for in a player - he is desperate to prove a point. Ten goals so far this season says it all. The former Red is comfortable as a second striker, an attacking midfielder or out wide. The kid from Blayney in country NSW has been one of reasons why fourth-placed Wellington are now genuine dark horses for the Hyundai A-League Championship. Phoenix set-up very similar to what Postecoglou has employed with the national team, so Burns shouldn’t have any troubles fitting in to his starting XI should he be picked for the group games against, first, Kuwait in Melbourne, then Oman in Sydney and finally Korea Republic in Brisbane. Burns knows all about Asian Cups, too, having been part of the Socceroo squad that reached the final in 2011, only to lose 1-0 to rival Japan in the finale of the Qatar hosted event. In total, 16 players who boarded the flight to Vitoria last May have earned a spot in the Green and Gold squad for the Asian Cup, the biggest ever football tournament to hit our shores. Another who didn't make the World Cup squad is Tomi Juric. But he's emerged since then and gives Ange a different option as a lone striker in a 4-2-3-1 or as part of a front two with Cahill just playing off him. Juric could emerge as Australia’s new striking hero after impressing during the Wanderers’ ACL run to Riyadh and the trophy in November. I hope so because we need that type of player to fire, but it’s Burns who looms as our X-Factor at the Asian Cup. After emerging on the Hyundai A-League scene with Adelaide United in the early years of the league, Burns took up a four-year offer from AEK Athens just before the 2008 Olympics. This included a loan spell later in his contract with second division Greek club Corfu, where he scored regularly to help the island side to promotion. Burns even scored for AEK in Sydney against Glasgow Rangers in a pre-season tournament at Allianz, the same venue he scored a brace last weekend. He parted ways with his Greek parent club after four seasons and ended up in the K-League, where it was a struggle to find regular game time at Incheon. Regular pre-season camps in Guam and periods on the sidelines with injuries would've been tough for this former AIS student. But a brief spell back in Australia with the Jets last season offered a glimpse of what he can do and some hope before he returned to Korea to sort out his contract situation (no doubt he’ll have some insider tips on some of the K-League stars set to face Australia). 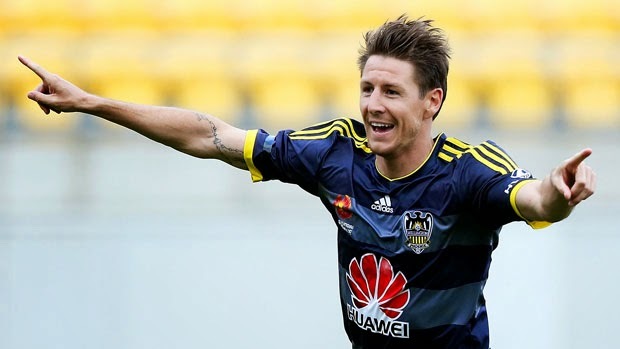 That was sorted out and now, at Phoenix, Burns has found his niche playing a starring role at Westpac stadium alongside a Kiwi with Scottish heritage (Michael McGlinchey), a star Dutchman (Roly Bonevacia) and a flying Fijian in Roy Krishna. After playing a bit part in the national team till now, Burns has been presented with a golden chance to show he’s part of this new golden generation Ange Postecoglou is bringing through. With this in mind, the Asian Cup can be Burns' breakthrough tournament and could help cement his spot in the Socceroo side for their FIFA World Cup qualifiers starting next year.